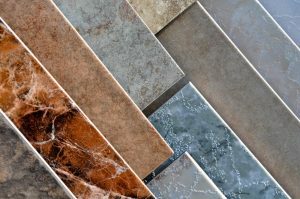 You have many choices when it comes to deciding on the best flooring and wall coverings for your kitchen and bathroom. Each room needs materials that can withstand the day-to-day use a family can bestow upon it. Porcelain and ceramic tiles are becoming an increasingly popular choice for use in both of these rooms. If you are on the fence regarding what type of materials to install in your home, here are six reasons to choose ceramic and porcelain tile in bathrooms and kitchens. Nothing beats the look of ceramic or porcelain in the bathroom and kitchen. Even if you prefer the look of natural wood or stone, you can find a ceramic or porcelain option to suit your tastes. Both ceramic and porcelain tiles come in a wide variety of styles ranging from vibrant colors to subtle patterns and everything in between. Ceramic and porcelain tiles are easily customized for creating features such as chair rails, railings, and even soap dishes. When every detail is created from the same substance, the result is a polished and sophisticated look that is difficult to rival. Porcelain and ceramic tiles are not confined to being flooring choices. They work great on walls as well. Tiles that are installed on walls are not only visually attractive, but they also add a perception of depth to the room by providing texture on the walls. You can choose tiles that have subtle patterns on them or intersperse alternating colored tiles for a more interesting look. Using textured tiles on the walls allows you to create a unique look with your own personal stamp. Both porcelain and ceramic tiles can be purchased at a reasonable price. Although higher-end ceramic tiles can cost quite a bit more per square foot, there are many options available for much less than that. On average, you can expect to spend a reasonable price or porcelain and ceramic tile per square foot. Porcelain costs a bit less than ceramic tile in some instances, depending on the styles you like best. A flooring professional can help you find the perfect porcelain or ceramic tiles for your budget. When you are considering flooring for heavily-used rooms such as the kitchen and bathroom, it is important to have flooring that can withstand the beating an average family can give it. These rooms are the ones that get the most use, so the flooring needs to be up to the task. Porcelain and ceramic tiles are both naturally resistant to fire, frost, moisture and stains. As a result, they are perfect for use in the kitchen and bathroom. Both porcelain and ceramic come in varying degrees of strength, so you must know what to look for when purchasing your tiles. Porcelain and ceramic tiles that have a Class 3 distinction will hold up under the heavy use it will get in the kitchen and bathroom. Even homeowners who love to clean want their surfaces to be easy to clean. No one wants to spend the entire day trying to regain the original shine and luster on a floor that has been subjected to daily use for only a week or two. Both ceramic and porcelain tiles are among the easiest flooring materials to clean and maintain. They can both be cleaned with a neutral cleaning agent. Also, both porcelain and ceramic are naturally resistant to germs and bacteria growth, making them sanitary choices that are perfect for use in both the kitchen and bathroom. Installing ceramic or porcelain tiles in your bathroom and kitchen will immediately improve the overall value of your home. Putting money into the kitchen and bathroom are the best home improvement investments a homeowner can make. If you are planning on moving in the near future, the presence of ceramic and porcelain are great selling points that will increase the interest of buyers to your home. Even if you are planning on staying put for a while, the increased value will remain for as long as the materials are present in the home. Ceramic and porcelain tiles have many wonderful qualities that make them an ideal choice for installing in your kitchen and bathroom. If you have questions regarding ceramic and porcelain tiles or would like additional information regarding installing them in your kitchen or bathroom, work with a skilled local flooring professional. From choosing the best possible tiles to superior installation services, you will be assisted every step of the way.